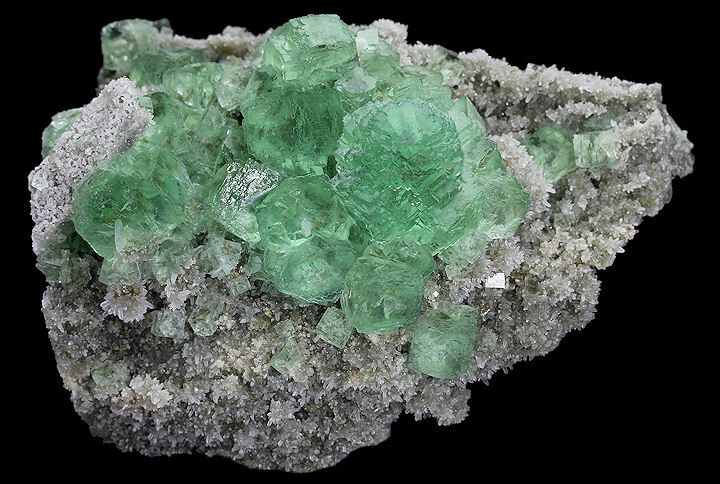 Beautiful, gemmy, light green Fluorite crystals with complex, stepped surfaces on a matrix of fine Quartz. 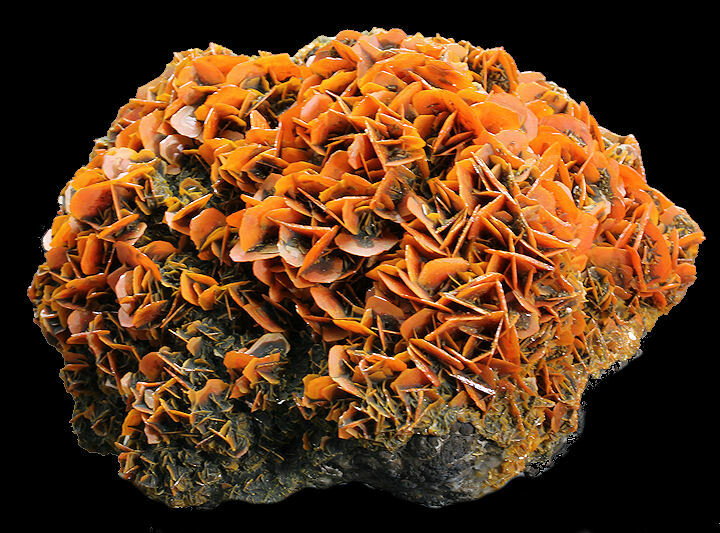 A very nice specimen from the recent find of Wulfenite in China. 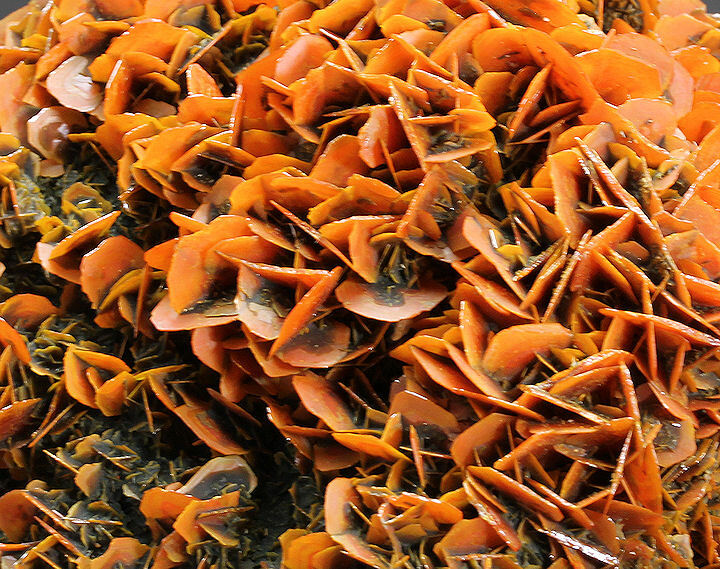 Numerous blades of lustrous, orange Wulfenite with very few damaged crystals. Super specimen of mustard colored, curved rhombohedrons of Siderite that are flattened to appear bladed, with partial coating of white Calcite. Fine specimen of dark pistachio green, lustrous, prismatic Epidote crystals (to 3x0.5 cm) on Andradite. Beautiful white Calcite crystals, with secondary growth of small Calcite crystals, on a base of Hematinic Quartz. 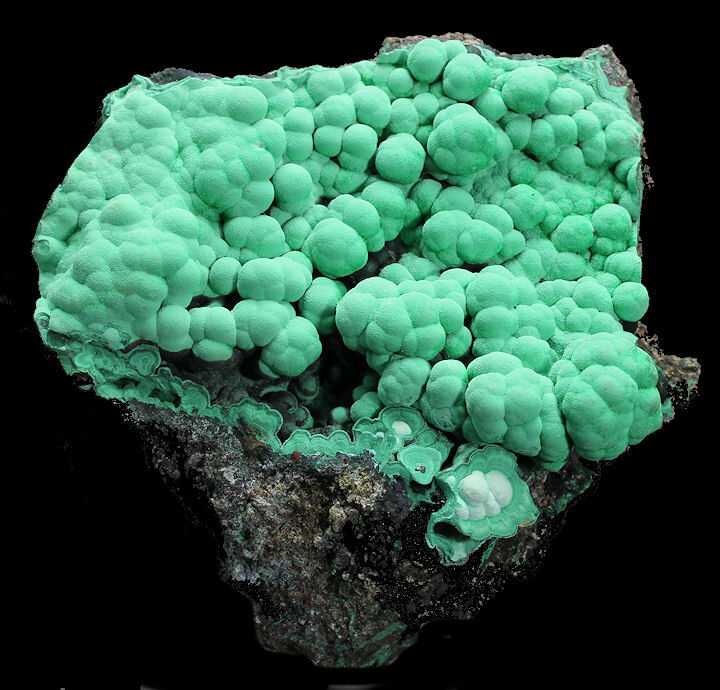 Lustrous Cuprian adamite crystals on Limonite. Mari or marlstone is a calcium carbonate or lime-rich mud or mudstone, which contains variable amounts of clays and silt. The dominant carbonate mineral in most marls is calcite, but other carbonate minerals such as aragonite, dolomite, and siderite may be present. Very nice, aesthetic cluster of highly translucent Gypsum crystals. In very good condition. A large beautiful plate of numerous, gemmy, dark purple tipped Amethyst crystals. In very good condition. An excellent specimen of relatively "rare green colored" Barite crystals formed in an intricate "floral" pattern. In very good condition. Very pretty, light purple Fluorite cluster with good translucency adorned with a Quartz crystal. In very good condition. Beautiful formation of super glassy Hemimorphite crystals in a shallow vug. In very good condition. Sharp, tetrahedral crystals of Tetrahedrite with great luster scattered among crystals of golden Pyrite, Galena and Quartz. In good condition. A notable large two sided Prehnite pseudomorph from a less well known New Jersey Trap Rock basalt quarry. 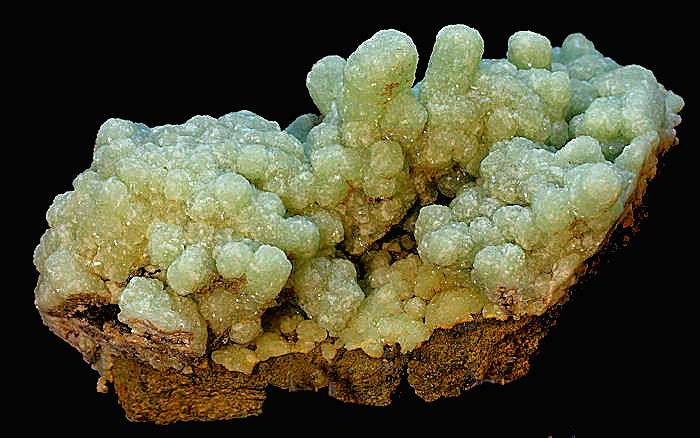 It is an attractive mint green, lustrous and moderately translucent specimen of Prehnite, which has replaced a dense, sculptural cluster of blocky Glauberite crystals on a basalt matrix. The pseudos are up to 3 cm in length. Prehnite usually pseudomorphs Anhydrite crystals from other well known New Jersey Trap rock quarries, making this exceptional piece from the Fanwood Quarry very unique. It is complete all around and pristine in the interior. A very desirable specimen from the collection of Dr. Ed David, who passed away in February, 2017. Beautiful, gemmy to translucent, golden, doubly terminated Calcite crystals, measuring up to 13x7x7 cm perched on a solid matrix of Sphalerite from the famous Elmwood Mine. In good condition. 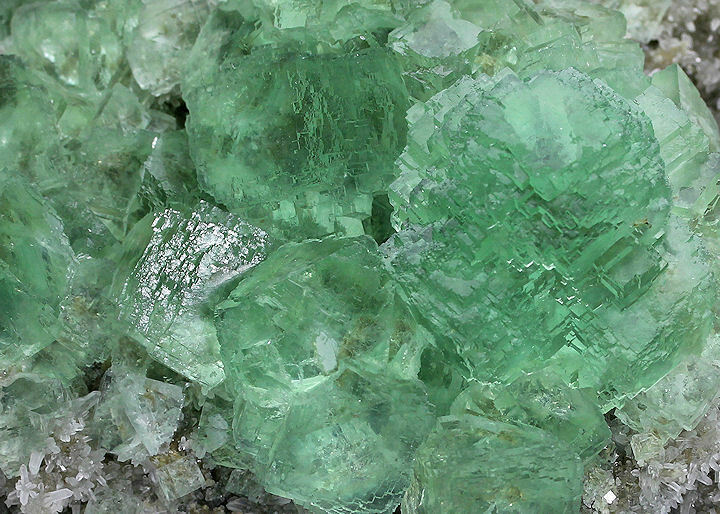 Numerous, super glassy and gemmy Fluorite crystals with beveled edges on matrix. Very nice and in very good condition. Rich coverage of very gemmy, light greenish yellow Barite blades on a triangular shaped matrix. In very good condition. Lustrous, creamy white, nail head crystals of Calcite crowning a contrasting brownish matrix. In very good condition. Beautiful cluster of lustrous, silvery Pyrite crystals with an aesthetic partial covering of snow white Quartz from a recent find in Peru. In very good condition. Pyrite cubes, measuring up to 3x3x2.5 cm, on Mari from the famous Navajun area. In very good condition. A splendid, sculptural formation of two sided Amethyst specimen from recent finds in Indonesia. These specimens were originally described as Agate, but recently have been shown to be Amethyst. Botryoidal Amethyst is very rare. This piece shows what appears to be two generations of Quartz. The first has the lavender to purple color more typical for Amethyst, while the second is very light lavender to snowy white in color - possibly caught in the process of transforming into the Amethyst variety of Quartz. Hemihedral, sharp laminar crystals of bright yellow Wulfenite on an aesthetic formation of Dolomite. In very good condition. Numerous, moderately translucent, purple Fluorite octahedrons on a Calcite matrix. In very good condition. Very nice, teal blue, lustrous Fluorite crystal cluster from the La Viesca Mine in Spain. In very good condition. A pretty stalagmatic formation of bluish gray to white Chalcedony. In good condition. A pine cone like formation of highly lustrous, yellow Calcite crystals. Very presentable on all sides, except for a contact point on the lower back. In very good condition. A very interesting pseudomorph where Quartz has been replaced by Anhydrite with a later growth of gemmy small Calcite crystals on top of the blades. In good condition. Check out the following mineral specimens on this page: Fluorite, Gypsum var. Selenite, Quartz var. Amethyst, Green Barite, Hemimorphite, Tetrahedrite with Pyrite, Galena & Quartz, Prehnite ps. after Glauberite, Calcite Crystals on Sphalerite, Barite Crystals on Matrix, Stilbite Crystals on Chalcedony in Vug, Pyrite Crystal Cluster with Quartz, Pyrite Crystals on Mari, Botryoidal "Grape" Amethyst, Wulfenite Crystals on Dolomite, Calcite Crystals with Marcasite & Fluorite, Blue Barite Crystals on Calcite, Multi-Colored Chalcedony Stalagmite, Anhydrite ps. after Quartz with Calcite, Sphalerite with Calcite, Wulfenite Crystals on Matrix, Siderite Crystal Cluster with Calcite, Epidote Crystals on Andradite, Hematinic Quartz with Calcite, Cuprian Adamite on Limonite and Malachite Crystals on Matrix.